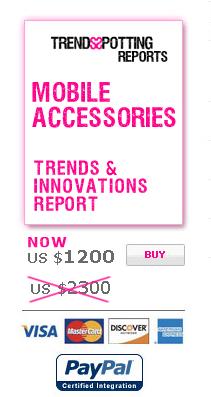 Based on exploration of over 2000 new accessories released since 2011 (+CES 2012) and a market analysis of major market trends characterizing this growing market of mobile accessories– TrendsSpotting Trends Research company has identified about 150 recent released products that can reflect new emerging trends in mobile accessories. The report analyzes the major consumer trends and design characteristics represented by the product innovations. TrendsSpotting has profiled the market according to 4 categories: Protective solutions, Charging solutions, Entertainment and Smart solutions integrating apps with hardware. 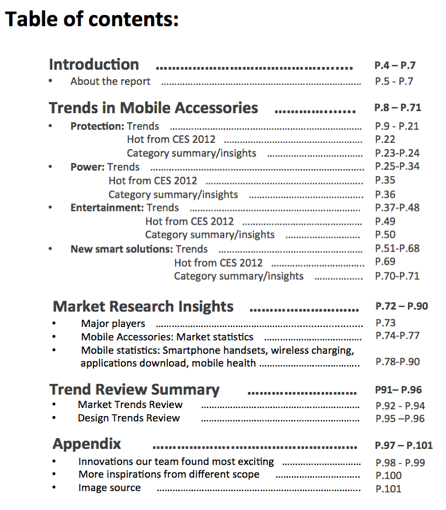 The innovations explored in this new report “Trends and Innovations in Mobile Accessories” are each profiled according to Product Categories and their subcategories, Consumer Trends Classification and User Experience Classifications. At the end of the report you can find Market Research Review (major players, market statistics), Consumer & Design Trend review. The report is presented in 100-designed PPT slides illustrating the major trends. Each trend’s slide includes product images, names of brands and companies, and current consumer prices. Consumer and design trends: Traditionalism, Hands free, Wearable devices, Storage, Soft and stiff materials, Fashion, Universal solutions, “On the go”, Wireless, multifunctional, daily tasks and activities monitoring, and more. User experience trends: Upgrade, Self expression, Effortlessness, Optimization, Lifestyle. Some of the companies / brands reviewed: AppToyz, AstroGaming, Asus, Bling my Thing, Blue Lounge, Braven, CaseInity, Case-Mate, Cobra, Dolce & Gabbana, Energizer, Griffin Technology, HTC, ID America, Idapt, Incase, Incipio, Innergie, Innovez, Iwave, Jawbone, Just Mobile, Kensington, Kingston, Logitech, Louis Vuitton , Martin Margiela, Miniwiz, Mizco, Mophie, Motorola, myFC, Nokia, Onlive, Orbotix, Oregon Scientific, Otterbox, Parrot, Panasonic, Philips ,Powermat, PowerSkin, Quirky, Sanyo, Skunk Juice, Sol, Sony, Speck, Technocel, Third Rail Mobility, Twelve South, Uncommon, WowWee, Zagg. The report “Trends and Innovation in Mobile Accessories” can assist mobile companies in their search for emerging trends, competitive advantages, new product developments, partnerships, design requirements, and can provide an updated comprehensive market knowledge. You are welcome to contact us here for more information on this report.